Slovenia’s President Borut Pahor has arrived in Tehran to hold talks with senior Iranian officials on avenues to develop political and economic relations. Heading a high-ranking politico-economic delegation, Pahor arrived in Tehran on Monday and was welcomed by Iran’s Energy Minister Hamid Chitchian upon his arrival at the Imam Khomeini International Airport. Slovenia’s Minister of Foreign Affairs Karl Erjavec has said his country plans to reopen its embassy in Tehran in November. 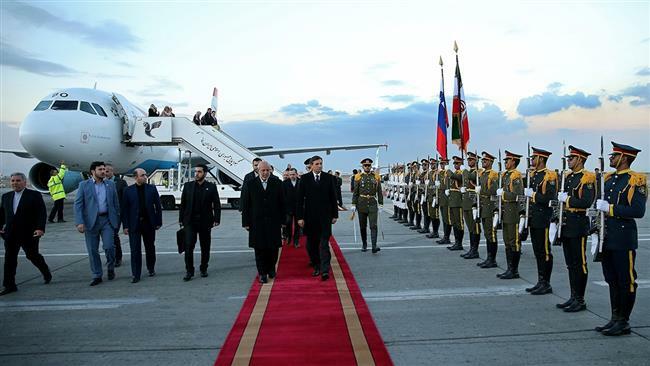 In a meeting with Iranian Foreign Minister Mohammad Javad Zarif in Tehran earlier this month, state secretary at Slovenia’s Ministry of Foreign Affairs, Darja Bavdaž Kuret, had announced the Slovenian president’s visit to Tehran. During Pahor’s stay in Tehran, Slovenia’s embassy would be reopened, she added. Slovenia’s Foreign Ministry announced in March 2013 that the country decided to shrink its diplomatic network as part of general austerity and close its embassy in Tehran in response to the difficult financial and economic situation in Slovenia. The value of trade exchanges between Iran and Slovenia has decreased in recent years and fallen from 96 million euros in 2011 to 46 million euros in 2012 and 25.5 million euros in 2013. However, Tehran and Ljubljana have been seeking to improve trade and economic cooperation along with political relations after the implementation of a nuclear agreement, known as the Joint Comprehensive Plan of Action (JCPOA), signed between Iran and the P5+1 group of countries in July 2015.